I am exhausted today. I went in to school today, moved all my furniture into place, unpacked and sorted all of my stuff, and started setting up my room. I will post some pictures later this week. However, today I am just too tired to write a long blog. So, I am going to share a few super short & simple tips. 1. This time of year I have a lot of cutting to do. Do you? Do you ever cut out a bunch of the same thing? You can save time by stacking the papers you need to cut (make sure they are facing the same way) and stapling the papers in several places outside of your cutting area. The staples will keep the papers from moving around as you cut. Just be sure you don't staple so many papers that you can't cut them. 2. Does your furniture look grimy? Are you wondering how to get marks off your whiteboard? Try a Mr. Clean Magic Eraser. I LOVE them. They make cleaning things soooo easy. 3. Do you write things on your whiteboard that you need to keep up for a while? 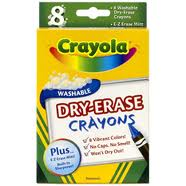 Try dry erase crayons. They stay put and are hard to erase. However, a Mr. Clean Magic Eraser will take them right off again. I haven't used the dry erase crayons yet but I've been wondering how they work. Great idea to use them for stuff that you want left up. Thanks for sharing! I live by the dry erase crayons! My second year teaching I had the dry erase markers and by Thanksgiving they were all dried out :-( Last year I got the crayons and they were WONDERFUL. No more replacing dried out markers and the kids loved them too!! Hope this helps!